"When we first drove down the driveway and saw the view we knew this would be a great vacation. Then when we got in the house, it got even better. Here's what I like about the location: everything! Here's what I like about the house: everything! We feel very fortunate to have sampled this wonderful place." - The Dibbles - first renters of Crockett's Beach Cottage in 2010. This is a great sandy beach cottage! As the last cottage at the end of a dead end private driveway shared with two other smaller cottages, this property is very private, yet shares one of the best sandy beaches in the area. (The sandy part is not accessible when the tide is high but is accessible 20 hours out of each day - a 25' line of softball sized rocks separates the lawn from the sand at the top of the beach). Leave the living room French doors open to the beach and relax in the seaside cottage atmosphere to the waves crashing while reading your favorite book. Enjoy views from the dining room as well. With the master bedroom windows open, the sound of crashing waves will sooth you to sleep. Easily keep an eye on your kids as they swim and build sand castles on the beach, or join them flying a kite or playing Frisbee on the large mowed lawn area of the property. Collect driftwood off the beach to use in the fire pit for evening hot dog and marshmallow roasting. Working with the agency was very easy. Everything is spelled out and they have always been very resonsive when called. Our third time staying at Crocketts Beach. Our favorite feature is definitely the location..just steps to the sandy beach where we can find sea treasures and walk to the small island at low tide. The house itself is well stocked and has everything we needed for our stay. On the water Maine was a pleasure to work with. Everything went without a hitch - which is just what one wants for vacation. The selection of homes was broad and it was especially nice to find, smaller affordable places for just the two of us. Wonderfully equipped home, especially the kitchen. Loved how close it was to the little beach. And loved the Sun room - it's where we spent all our time! Since this was our second time working with your agency, everything was more familiar. All aspects of the rental process went smoothly. We only had 1 issue with the property...a squirrel (I think) made its way into the roof/ceiling and I called to report it. The issue was taken care of that day and we had no more visitors. This was our 2nd time staying at the Crocketts Beach property. I feel like it has become our "home away from home". We love the location of the house..just a few feet from the beach. We can listen to the waves break on the shore at night and enjoy the clear starlit sky. The house has all the amenities we need on vacation..outdoor tables and chairs, a gas grill, even beach toys and games for the kids. Pretty much everything we need for everyday life is provided. 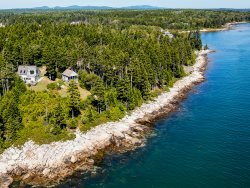 We've rented from On the Water in Maine several times and will continue to rent through them for years to come. They are very professional and communicate clearly with their customers. The properties have always been as-advertised, with all of the amenities that one needs to enjoy themselves during their stay. The few minor issues that we've had at properties over the years were quickly resolved. Beautiful little cottage, perfect for our family of 4. We loved having the beach right out the front door and the view was fantastic. We enjoyed having meals on the deck and listening to the waves at night. We knew that we loved the Owl's Head area from prior visits and this location was perfect for us. Loved the organized information presented to us every step of the way. On the phone, everyone we spoke with was friendly and helpful. We truly enjoyed the ocean living experience for a week. The amount of windows allowed viewing from everywhere and the morning sun quickly warmed the cottage on the chilly mornings. The house was totally stocked with anything we could want. Everything was in working order. Tiffany and Justin, the Owners of On the Water in Maine, are always great to work with. They whole rental process is incredibly efficient. Always a quick answer to any questions or concerns. We love Crockett's beach cottage. We have stayed there for 5 years and look forward to returning next year. The perfect spot to relax! I have had only positive experiences renting with On The Water In Maine. I love the site. It is the perfect spot to spend our vacation. Everyone at the agency was helpful and knowledgeable. Because the property wasn't rented the week after we were there, and we couldn't bear to leave, we arranged a couple extra nights to extend our time there. Phone calls were always answered or promptly returned. Staff was very friendly and pleasant. The location of the property was the best! Whether sitting on the deck, out front at the table, or at the dining rm. table the view was outstanding. Going to sleep and waking up to the waves crashing on the rocks was so relaxing. Actually all features of the property were above and beyond. Every amenity was provided, the kitchen well stocked and the house was clean. We took advantage of some of the extra beach chairs and toys. A wonderful time was had by all! Justin did a great job dealing with an issue with our original reservation. He turned what could have been a real problem into the best vacation we've had. Thank you. Crocket's Beach Cottage combined the coziness of a cottage with all the comforts of a home. We had a great stay, and really enjoyed being able to walk right onto the beach. Everyone was incredibly friendly and helpful. Each phone conversation left me feeling happy. Despite the bad weather, we had a wonderful time at this property. We were traveling with two small children (ages 5 and 2) and the house worked out really well. The single story was perfect (no stairs to worry about! ), great bedrooms and the owners had everything thoughtfully laid out in the house (extra hooks for coats and bags in the sunroom, as well as for towels and robes in the bathroom). The views were amazing and our favorite times were spent around the dining room table. Our daughter also has severe food allergies and we rely on cooking at our vacation property and we were able to find everything that we needed (and then some!) at this home. We are grateful to the owners for providing so much of their personal property for us to use while we were there (children's books, toys, beach items, etc.). It was a joy to share your small piece of wonderment on the Maine coast. This is a great cottage with a wonderful little beach - love the privacy and quietness! This was our second year stayingat Crockett's Beach Cottage - we love it! Looking forward to being back next year! On the Water In Maine was very organized from start to finish and provided a smooth rental process for us. We needed help with a minor situation at the cottage and Justin responded immediately and it was taken care of. Crockett Beach Cottage was the perfect location for us. We loved the privacy, having the beach steps from our front door, and the Town of Owl's Head itself. We loved being close to Owl's Head Light, Birch Point State Park, The Owl's Head Transportation Museum, The Coastal Children's Museum, Rockland and Camden. You guys were great about communicating and providing clear directions. The view is fabulous and the place has all the right things to enjoy the beach, like chairs, toys etc. Ahhhh ... Maine ... It keeps getting batter and better! We love Crockett's cottage. The beach and the view are spectacular. We were hoping that we would get another visit by the bald Eagle like we did in 2012 and we did! We all spent dinner outside watching as he was scoping out his catch waterside for the night. All the while he was being chased by the Gulls what a site. Dinner and a show for free! Amazing. THANK YOU ALL FOR MAKING THIS SUCH A SPECIAL RETREAT. On the Water in Maine, thank you so much for being so accommodating!!! We loved the privacy that we had on Crockett's Beach, it was so nice for the kids to be able to play and not "blend in" with all the other children....very relaxing! Your cottage was wonderful, My husband and I along with my mother and our 3 children stayed for a week and we LOVED it. We really enjoyed the collection of sea glass you guys had!